Death of Right Rev. Monsignor Martin, V.F. It is with sincere regret that we announce the death of the Right Rev. Monsignor Lawrence Martin of St Mary’s Kyneton, which occurred with tragic suddenness at Kyneton on Monday morning last. Msgr Martin was apparently in his usual health when he retired to rest on Sunday evening after having officiated during the day at the services at St Mary’s. At 6.30am on Monday he left his room and proceeded towards the bathroom, spoke to Fr Kelly, asking him to celebrate the early Mass. Monsignor then entered the bathroom, and it was not until midday that anxiety was felt when Fr Kelly, going to Monsignor’s room found he was not there. The bathroom door was then opened and the body was found lying on the floor; death having evidently taken place several hours previously. On 9th January, 1920, the Very Reverend Dean Martin, P.P. of St Patrick’s Kilmore, and a native of Drummond, was appointed as Dean of St. Mary’s, Kyneton, in succession to Very Rev. Dean Hegarty. He at once showed a keen interest in the history and traditions of his new parish and early set about the beautification of the surroundings of the church he loved so devotedly and of the presbytery. On 24th June, 1921, he attended the ceremonies at St. George’s Carlton, in connection with the sacredotal jubilee of Very Rev. Dean Hegarty, P.P.,D.D., V.F. The need for a parish hall to replace the old wooden structure which had done service for 70 years, having been built by Fr Stack in 1851, and in which Very Rev. Dean Geoghegan celebrated his first Mass, was impressed upon the parishioners by their new Dean in October of 1921, and within a short period the handsome hall known as St. Mary’s was erected on the original site in Hutton St. In June, 1922, St Mary’s church was first lit by electricity and the following year the interior of the sanctuary was artistically decorated and a handsome new altar of Sicilian marble was erected and dedicated to St Joseph. On 27th September, 1925, His Grace, Archbishop Mannix appointed Dean Martin to represent him at the celebration of the Golden Jubilee of the Bishop of Armadale, an honour which the Dean most fully appreciated. In March of 1926, the beautiful Gothic marble altar rail was erected in St Mary’s to the memory of Very Reverend Dean Hegarty who died on 6th May 1925, and at whose obsequies at Kyneton, Dean Martin officiated. At the close of 1926 the new Convent Chapel, with its beautiful stained glass windows and handsome appointments was blessed by Abp Mannix, and in the following year an altar in the chapel in memory of Dean Hegarty was blessed and dedicated by the Abp. during the absence of Dean Martin who had been on a visit to the Old World, including Rome, England, Ireland, Germany, Belgium and other countries. During that visit the Dean had the privilege of kneeling at the feet of the Holy Father Pope Pius XI and paying homage in person to His Holiness the Vicar of Jesus Christ, and he ever felt conscious of the honour and joy at the graciousness of his reception by His Holiness. On his return home his parishioners showed their love and esteem for the Dean by a remarkable demonstration of welcome, in which all portions of the parish participated. His interest in the welfare of the young men of his faith in training for the priesthood was evident when, on March 25th 1928, he presented to the Corpus Christi College, Werribee, the historic chalice which had been used by the Rev. Bonaventure Geoghegan at the celebration of the first Mass at Melbourne. On 9th May, 1929 the announcement was made that during the preceding February His Holiness Pope Pius XI had appointed Rev. Dean Martin a Domestic Prelate with the ecclesiastical title of Very Rev. Monsignor Martin and ranking next to that of a Bishop. The conferring of this honour on the Parish Priest of St Mary’s Kyneton called forth nationwide congratulations and the parishioners showed their loyalty to the church and the Monsignor with increased piety and service. Perhaps the crowning glory of Monsignor’s ministry at St Mary’s was the erection of St Teresa’s primary school, in the building of which he took a great interest. The school was blessed by Archbishop Mannix on 25th November 1933 and named St Teresa The Little Flower in honour of the patron saint of Msgr Martin. The establishment of the Marist Brothers in the town was also due to his energy and foresight. A steady progressive policy was maintained by Msgr Martin throughout his ministry, and in the past two years no less than 1,500 pounds was spent on parish properties. The church was re-roofed, the walls painted and the entrance adorned with a narthex screen in Gothic design in polished maple in keeping with the new staircase leading to the choir stalls. The vestry floor and choir gallery were covered with rubber matting to match that laid in the main aisles of the church and the Stations of the Cross were cleaned. In the parish hall a new platform and proscenium were added, and at St Teresa’s school a new dividing fence was erected. The churches at Malmsbury, Lauriston and Edgecombe were each renovated and all freshly painted. The handsome wrought iron gates erected recently and the fine concrete paths laid down in the grounds were other outstanding improvements. St Mary’s Church of the Holy Rosary has been served by three great churchmen – the dearly loved little Dean Geoghegan, whose gentleness and love of little children were so outstanding traits of his Christian character; by Dean Hegarty, bluff, witty, cheery and deeply affectionate to his people and who zealously loved his church and was yet broadminded enough to offer and receive the deepest and truest of friendship from those who were non Catholic, whose cheery wit, breezy good nature cheered all who came in contact with him and whose one great passion was establishment of convent schools for the girls of his parish, a passion that saw successful completion. Then came Dean Martin – imbued with a deep love of the district where his forbears early settled, and a definite desire to build up the church in its midst. His devout soul felt that nothing in ecclesiastical art or architecture was too beautiful for the Church where the Divine Presence always lingered. Both within and without its surroundings and its furnishings must be beautiful and attractive if it were to do honour to the Great Creator of the Universe. So he set himself to beautify St Mary’s and not St Mary’s alone but every church in the parish. What he did in this direction remains as his monument. To provide education for boys equal to that already provided for girls led him to secure a handsome building for the Marist Brothers and there establish a successful school. All this was done with no diminution of his priestly zeal, for during his pastorate in Kyneton many and very successful spiritual missions have been held. His love for growing youth was deep and sincere and he rarely passed the boys and girls of the church without a cheery word or a chat. But his spiritual activities passed beyond St Mary’s Church. 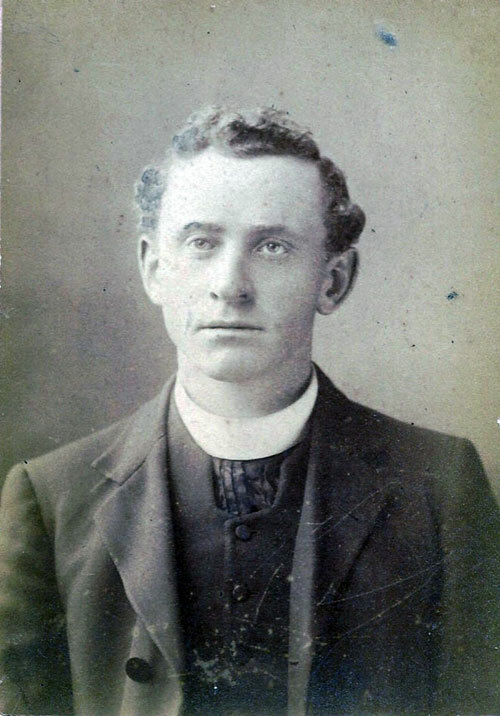 He was mission-minded and for years was president of the Australian Society for the Propagation of the Faith overseas and frequently entertained missionaries from abroad at the Deanery. In 1931,Monsignor Martin was honoured by the Commonwealth by having the long-service decoration of a first class chaplain of the Colonial Auxiliary Forces. He was interested in the progress of the town, especially in the swimming facilities of the Campaspe and in tree planting. His fellow townsmen have cause to regret his passing but he has left the district immeasurably richer by his vision of church beautification carried into practice, his intense interest in education, his love for the town and district and the land of his birth, his devotion to duty and his kindly charity. To them will come the consolation of knowing that he who had for so many years been a faithful shepherd to his people has been spared a long illness but as he would have wished answered his call home with his hand on the plough. At a meeting of the K.W.N.A. the president, Miss Armstrong, expressed the deepest regret at the passing of Monsignor Martin, a churchman whose sudden death meant an impoverishment of the district he loved and whose splendid work for his church would be a lasting memorial to him for generations to come. To many non-Catholics as to herself his death meant the loss of a personal friend, while to his co-religionists it is a severe bereavement. After the gathering had stood for a minute in silence, Mr S. Walker asked that he might associate himself with the expression of sympathy and regret at the passing of a great churchman, of whom in all parts of the electorate he had heard spoken in the highest terms of esteem and praise. Reference was made at the meeting of the Kyneton Hospital committee to the death of Mons. Martin, the president (Mr. W. Hartigan) paying a tribute to his fine work in Kyneton, and stating that he had been a frequent visitor to the sick at the hospital. Members stood in silence for one minute to his memory. A Solemn Requiem Mass was celebrated at 11am on Wednesday in St Mary’s Kyneton, after which the funeral proceeded to the Kyneton cemetery.